Refrigeration systems contain high pressure gas, some of which can break down into poisonous gasses when heated. The voltages used are lethal. If you are not confident, do not proceed. Recovery operations begin with the recovery machine. It is used to remove the refrigerant from a system so work can be done on the air conditioner. The video below gives an overview of the recovery machine. To speed the recovery operation on a system that has an operating compressor, you can use the compressor to sped up the operation. The video below explains the how this is done. The video below covers the procedure for using the recovery machine to remove the refrigerant from an air conditioner or refrigeration system. When the refrigerant is removed from the unit, it must be stored in a reusable cylinder that can be used to send the refrigerant to a recycle company. When the cylinder is new, it must be evacuated before being used. The video below covers how to commission a new cylinder..
Recovery machines are expensive and require some maintenance to last. The video below covers some of that maintenance. 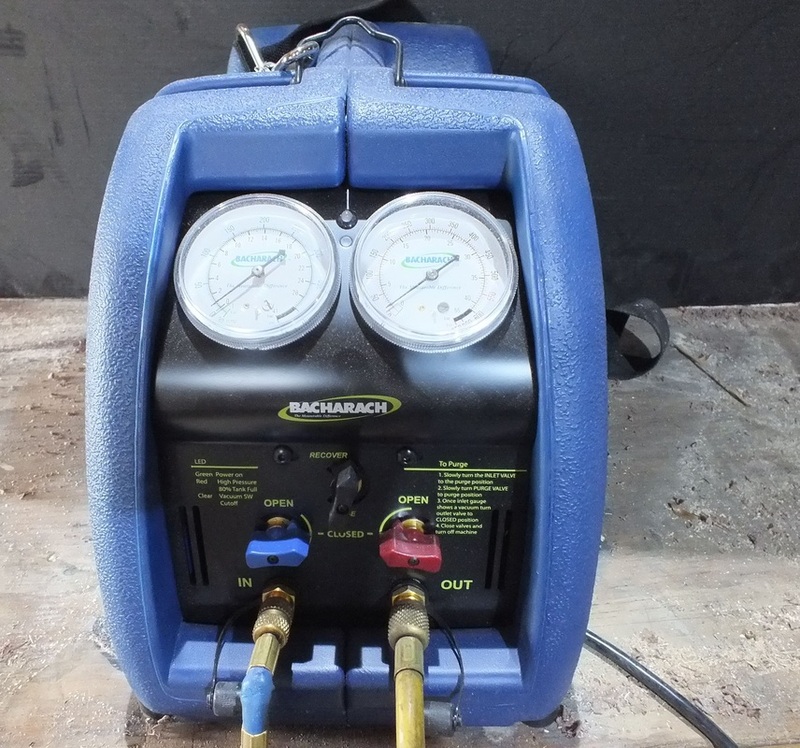 On units with service valves, the refrigerant can be pumped down into the outdoor unit when repairs are necessary on the indoor coil or the line set. The video below covers how to complete this operation. Recovery of refrigerant in the air conditioner. Since the early 1990s, it has been required by federal law to not allow refrigerants to be vented to the atmosphere. To comply with this regulation, we recover refrigerants. The refrigeration system is a closed system that should have only 2 chemicals inside. Refrigerant and oil. Air and moisture in the system will cause corrosion and deterioration of the compressor motor windings. Moisture can freeze and block the expansion device. To keep out the moisture and air we use a vacuum pump. This pump is capable of very deep vacuum. The video below is an introduction to how it works. The video below makes a comparison between a flexible vacuum hose and a hard pipe on how well each holds vacuum. This one is an answer to a question about flexible and hard pipe of the same length in vacuum. The purpose of the evacuation is to remove all gasses in the system. Most importantly, moisture and non condensible gasses need to be removed. One of the most effective ways to remove these gasses is to flush the system with the refrigerant that is to be used by doing multiple evacuations and breaking the evacuation with refrigerant. Below is a video that explains graphically how I accomplish this. Below is a video showing how the triple evacuation is accomplished.